In 1970, San Francisco firefighter Cecil De Loach and his wife Christine staked their claim in the wine grape business by purchasing 24 acres of old-vine Zinfandel in the Russian River Valley of Sonoma County. In the early seventies, the De Loaches decided to acquire additional vineyard land. For several years they watched others make notable wine from their grapes before making the decision to produce wine under the De Loach label in 1975. More than three decades later, Cecil and Christine sold that label and have continued their winemaking skills at the helm of a small family winery that employs a simple philosophy - craft exceptional wines, from the highest quality grapes, that people love to drink. We consider each step of the winemaking process an opportunity to showcase the distinctive flavors contained within our carefully cultivated grapes. 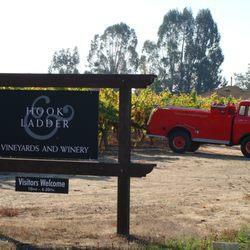 Every bottle of wine is a worthy representation of the best effort from each and every person at Hook and Ladder Vineyards and Winery. This pale straw colored Chardonnay leads off with a rich bouquet of apple-butter, honey suckle, lime blossom and notes of lemon candy, which is closely followed by a full mouth of golden delicious apple, citrus, and pear flavors. Hints of lemon and lime compliment the long toasted butter finish. "The Tillerman is deep red-violet in color, possessing complex aromas of ripe fruit, and hints of cinnamon and dry herbs. A palate of cherries and leather, with a lingering currant and ripe cranberry finish allow this blend to show well through rich meals, yet not overpower lighter dishes.